2019-04-15 - Frankfort, KY - Photo courtesy Kentucky State Police. 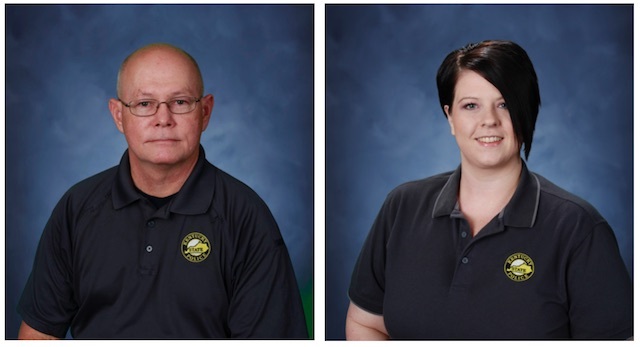 The Kentucky State Police is recognizing two dispatchers during National Public Safety Telecommunicators Week, because of life saving actions on the job. "Their quick response made a real difference that mattered," said KSP Commissioner Rick Sanders, "That's why the Kentucky State Police consider our telecommunicators some of our most treasured assets. It's a noble calling that can provide a very fulfilling, admirable and honorable career." At left, Somerset-resident Randall J. Adams, the son of the late Jessie Adams of Columbia and Verlene Adams of Somerset. At right, Lawrenceburg-resident Megan Smith, the daughter of Greg and Patty Wolf of Lawrenceburg, KY.